Both Falcao and Lewandowski to sign for Chelsea? I wrote a post last week which has had plenty of attention concerning Robert Lewandowski and him signing for Chelsea. After Jose's comments a few days ago, Chelsea could end up signing Lewandowski AND Falcao! 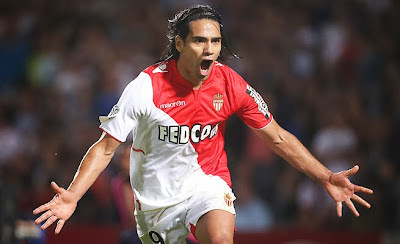 Reports have surfaced today that Falcao could possibly be available on loan this January as he is unhappy in France. Now, this is interesting because a loan deal would be far less expensive than buying out his contract, would be financially feasible and most importantly of all, he would be available to play in the Champions League. "The point is not wanting or not wanting, but that the top strikers are already in their clubs, clubs who are not going to open the door for a crucial player to leave. And the biggest percentage of them cannot play in the Champions League. The investment for players who cannot play in the Champions League we don't think is the correct one. We have a plan. We have a board. We have financial rules that we think we have to obey and we have to follow. And, at the same time, we started the season with this group and, most probably, we're going to end with this group. At the end of the season we will be in better condition to analyse our squad, to analyse the market and, normally, make a couple of changes to improve the team for next season. But this season, we are ready to go to the end with the same people." So signing someone like Falcao on loan would fall into place. He would still have the existing group with a loan signing as an addition who would then leave at the end of the season. Now if that deal happens you would imagine that part of that agreement would be an arrangement to buy the player in the summer. Looking back to the Mourinho quotes, they come as no surprise based on the fact that plenty of the big name strikers that would be Cup tied in the Champions League but Jose's comments here are key when it comes to Robert Lewandowski. He is in the Champions League this season so Dortmund would be unwilling to sell. As we know, his contract is expiring and if Chelsea (who are already in advanced negotiations with him) can tie up the signing, it will cost us nothing, just his wages and signing on fee! Of course we have to wait and see what happens but I am almost certain that the Lewandowski deal is done and dusted for next summer. This means Dortmund get to keep him this season so they are happy and we get him afterwards. In the meantime, if we can add Falcao to our books on loan to the end of the season, it would prove to be a master stroke by the club! If YOU had the option to sign Falcao or Lewandowski who would you choose? If you could have them both as reported above, one after the other, would you be happy with that? Let's see what happens next month!